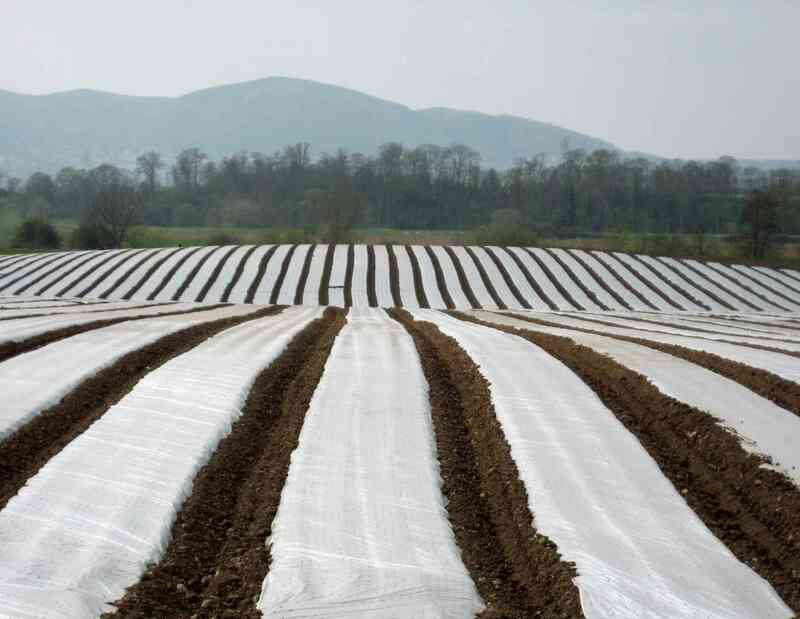 Above: A plastic-covered field that looked like a lake. 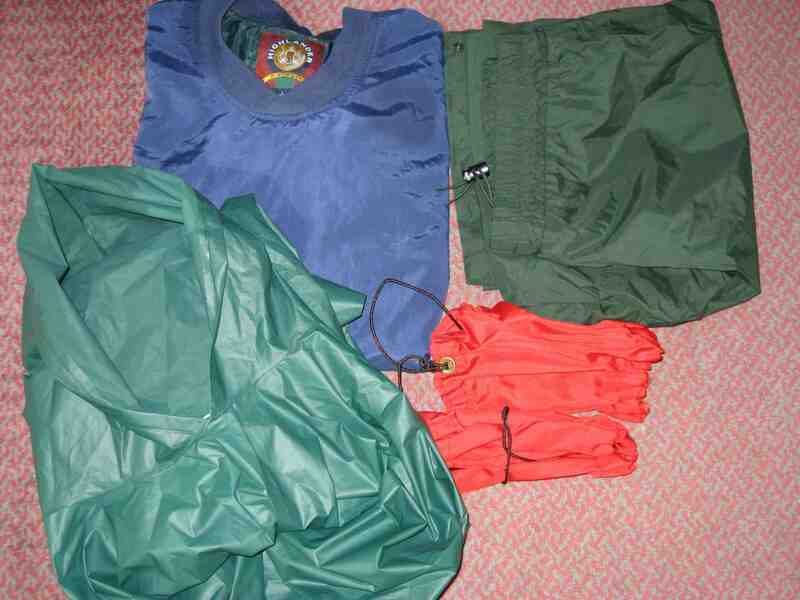 Below: Some clothes I jettisoned at Tewkesbury to save weight; and (foot of page) recovering from blisters. 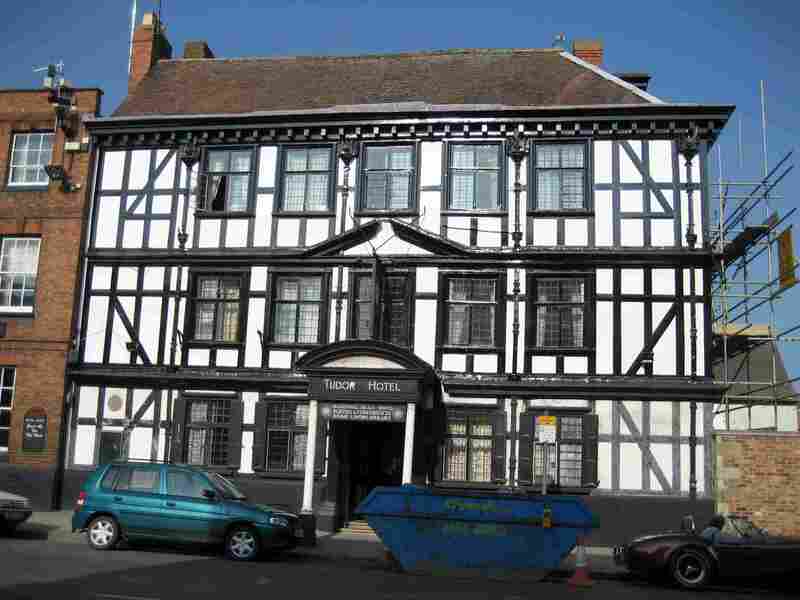 The Tudor House Hotel in Tewkesbury is a wonderful old place. Some of it dates back to 1540. It has the rough timber beams and sloping floors that go along with its age. What I liked about this particular place, though, was its resident-owner/manager, who maintained high standards even as he mustered the energy and money to renovate. Mr. Sardinha is on the right track for sure. Mr. Sardinha’s hotel is the sort of place you can sink into an old leather armchair, and sip a sherry because that always tastes better than beer when you’re in a leather armchair. If you’re with the blokes, you can offer one some port (“Have some port, old sport”), which he might benignly decline (“I’ll have some wine, old swine”). The ladies might surprise you by accepting a beer (“I’ll have a beer, my dear”), and over all, Mr. Sardinha will preside, a gracious host, doubtless joining you in a toast to young love and old girlfriends. It was Easter, and breakfast service did not start until 9 am. This gave me time to read a little. The wainscoting in the olde breakfast room was surmounted by a shelf of leather-bound volumes, just the thing to read on a holiday morning while you sip your coffee. Earlier this morning, I worked on my backpack weight again. I had already pruned my pack's weight before I set out from the States, by dumping a lightweight tent and sleeping bag among other things, and I made a similar pruning in Cornwall. At this point in Gloucestershire, there was no "low-hanging fruit"; more weight reduction could only come from an ounce here and an ounce there. Those were ounces of articles that I had previously concluded were indispensable. Items I definitely did not need (such as a paper list of accommodation in areas I'd already departed). Then I planned to dump the last category and work like mad at the second. As my friend and mentor, Mark Moxon, had said: weight reduction can be quite enlightening. After enlightening self-analysis as described, I think I shaved perhaps 2 lb, which would bring my backpack down to 19 lb, leaving my bellypack still at around 3 lb. Things that piled up in the hotel garbage included a fine wind-resistant pullover; some backup raingear; all shaving cream and some toothpaste; my cell phone service guide; some paper and envelopes for writing home; some underwear; a spare wrist-strap for my hiking pole; my band-aid box; a manila folder; and two waterproof, transparent pouches that I'd made to allow me to hang a map and PDA around my neck. No shaving cream? I can use hotel soap. Less underwear? I'll wash clothes every night. No transparent PDA pouch? I've gotten used to pulling the PDA out of my bellypack, which has a waterproof cover I made from nylon envelopes. I think the pack felt lighter when I set out today. For that or some other reason, I covered six miles in my first two hours. My route ran up the A38 until I could get on a right-pointing country lane, and then on the Severn Way (also named Three Choirs Way here) into Worcester. 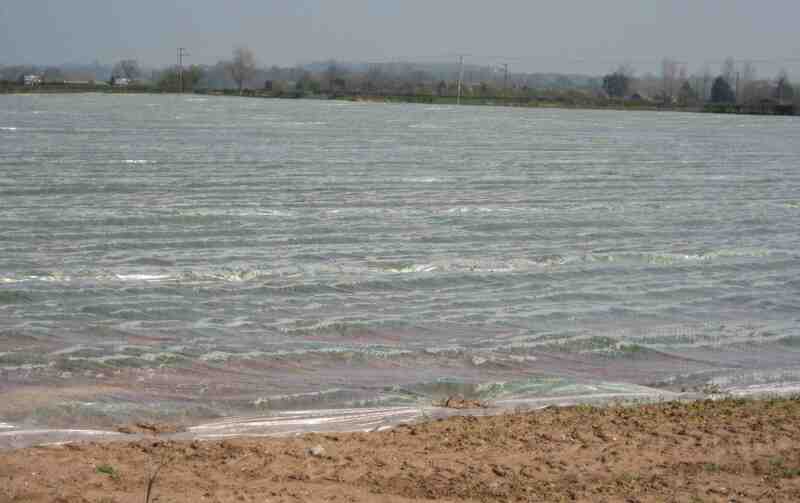 The Severn Way was proving a mixed blessing again. It was certainly peaceful and free of traffic. 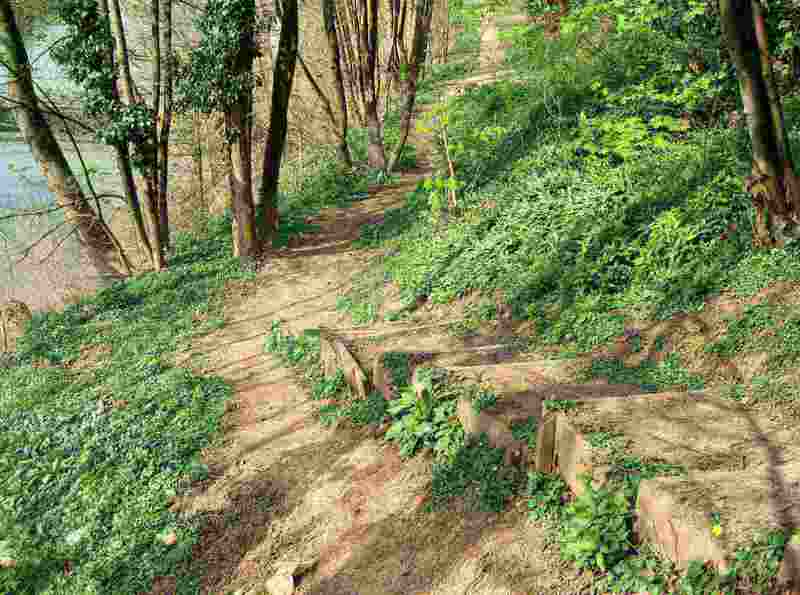 But, underfoot, it varied from a smooth grass path to an up-and-down rough footing as it clawed a path along the steep banks of the Severn. In places, the brush overgrew the trail; and in other places, tributaries forced inland diversions. The views were bland and only enlivened by an occasional pleasure boat. I had seen many such before. The Severn in this area was the scene of record-breaking flooding later in the year. In July, which is when sane people go hiking, I wouldn’t have been able to take this route without swimming. In April at the time, it just seemed like summer even though it was spring. I haven't much reported on my knees and blisters recently. The knees were holding up extremely well, even without any painkillers, except going downhill. Overall, they'd surpassed my hopes, and (knock on wood) no longer had show-stopping potential. My blisters, on the other hand, remained a pain. I think that abandoning the cushion insoles I'd had in my boots made enough room to remove the source of the irritation. Unfortunately, I had to hope that the existing blisters would heal without causing further problems. That was by no means guaranteed. I had five black nails. On previous experience, a new nail would grow underneath each existing black one, and the existing nail would then part from the toe. I had to hope that this process occurred without pain or other complications, but the process would take weeks – perhaps 10 to 20 weeks based on previous experience. My more regular blisters currently numbered about five as well, and I thought I'd be all right with those. I soaked my feet at night when I could. In fact, it was quite a chore maintaining Hobson the hiker and his clothing at a different inn or B&B each night. I used the word "inn" because I'm staying in them often enough now. In Worcester I found Ye Olde Talbot Hotel, more like an inn in conjunction with its pub. It's got a comfortable ensuite room, which is the British term for a room with its own bathroom.Too bad, there's no heat to dry my clothes. But that's what an iron and hairdryer are for! Worcester has a fine cathedral, but what was special about Worcester for me is that it wasn't Gloucester.